A science and nature biography of elephant expert Cynthia Moss. 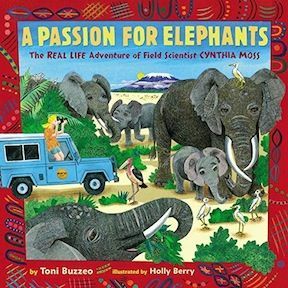 The setting for this picture book is generic “Africa,” a place “Many people might be afraid to go…all alone.” Cynthia Moss an American scientist from Ossinging, New York “was not afraid of the BIG continent.” She settled in “the wide-open savannahs of East Africa” and got a job photographing elephants. Later she founded the Amboseli Elephants Research Project. The rest of the book follows the typical story arc about Westerns saving animals in “Africa.” There are elephants aplenty pictured here but not a single African. The back pages are specific about where in East Africa Cynthia Moss worked (Kenya) but no clues in the story for children. Not Recommended.